This is one of the most extraordinary pieces of Indian silver that we have seen. It is massive. 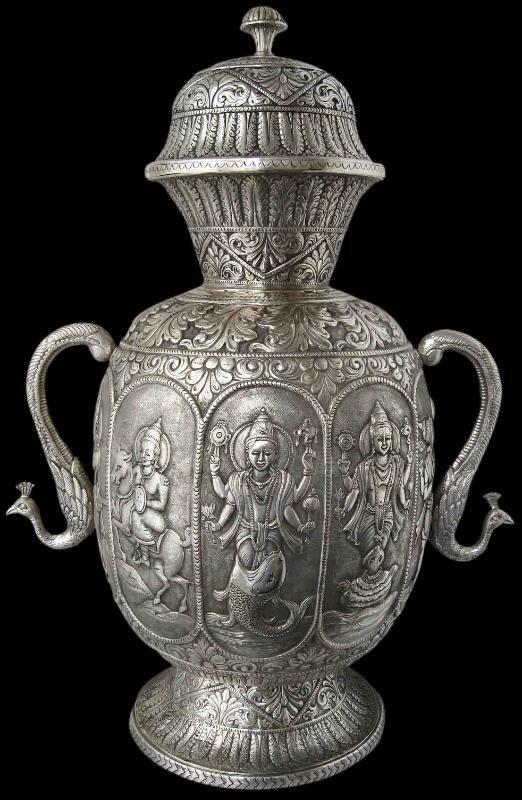 It is 67cm or more than 26 inches tall and yet the maker has not economised on the silver used: even given its height and girth, this vase is surprisingly heavy to lift on account of its thick walls. As such it weighs around 7kg (approximately 15.4 pounds). 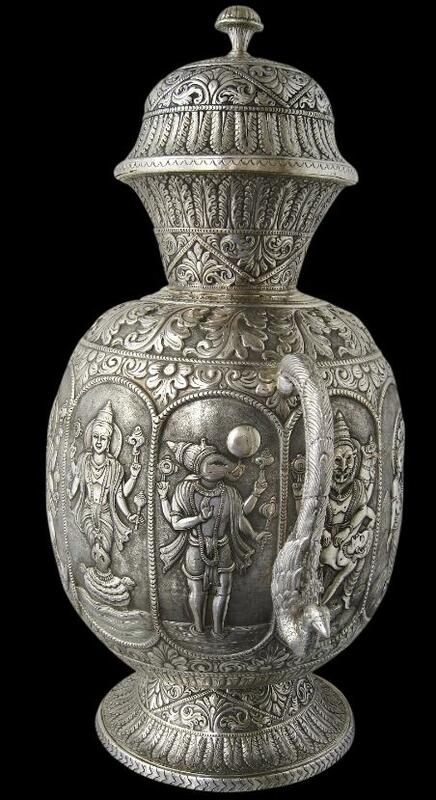 The vase has an elongated barrel-like body, sits on a flared foot, has a domed lid with a prominent finial and two hollow cast peacock handles on either side. The lid, foot and upper and lower sections of the body are repoussed and chased with leafy flourishes and borders. 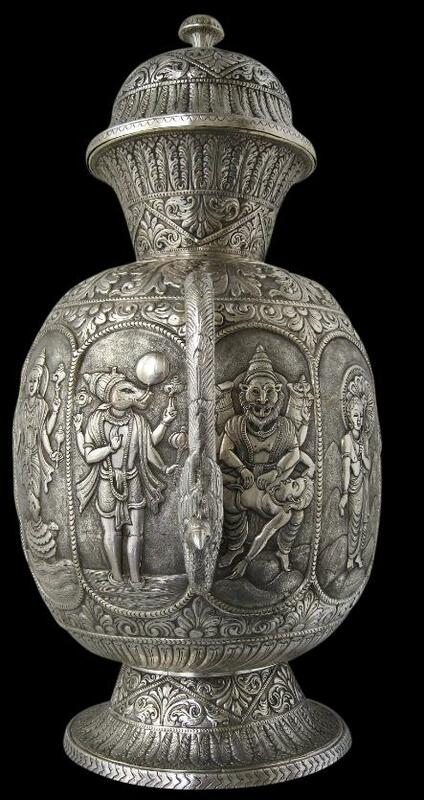 But the main decorative element are the ten large oval panels that stretch right round the body of the vase, each of which is features one of the ten most well known avatars of Vishnu, collectively known as the Dasavatara. Each is particularly well depicted with fine chasing work. Satya Yuga (the first of the four Yugas or ages of the world in Hindu lore). The next three avatars appeared in the Treta Yuga. The eighth avatar appears in the Dwapara Yuga. The ninth appears in the Kali Yuga – this is the current Yuga: we are living in the Age of Kali. And the tenth avatar, Kalka, is yet to make his appearance. This will occur at the end of the Age of Kali. Overall, this is an extraordinary and massive work. The condition is excellent: there are no dents or splits. 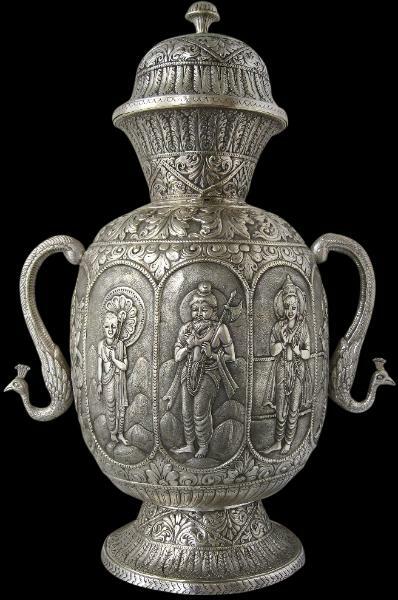 In essence, it is a remarkable work that represents the fusion between European form and Hindu Indian motifs, a consequence of the Indian colonial experience. Garde, A., & S. Raulet, Maharaja’s Palaces, Philip Wilson Publishers, 1996. 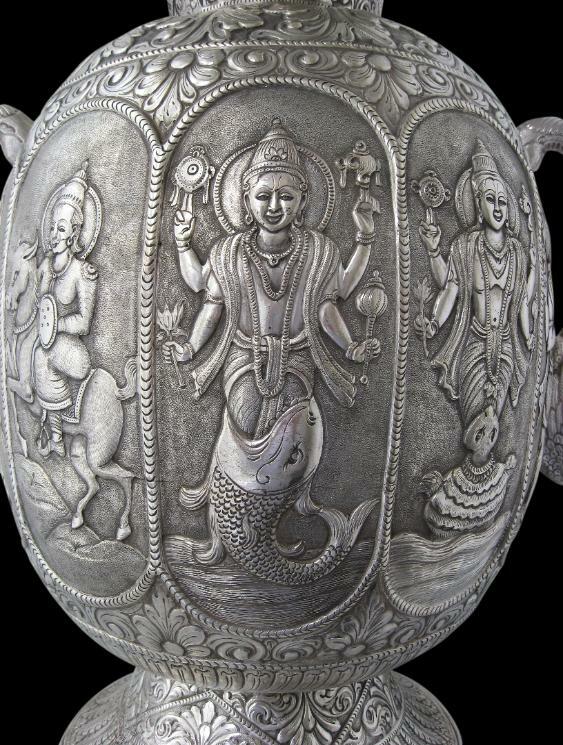 Matsya, the fish-avatar who saved Manu, the creator of mankind, from the great deluge and rescued the Vedic scriptures by killing a demon. 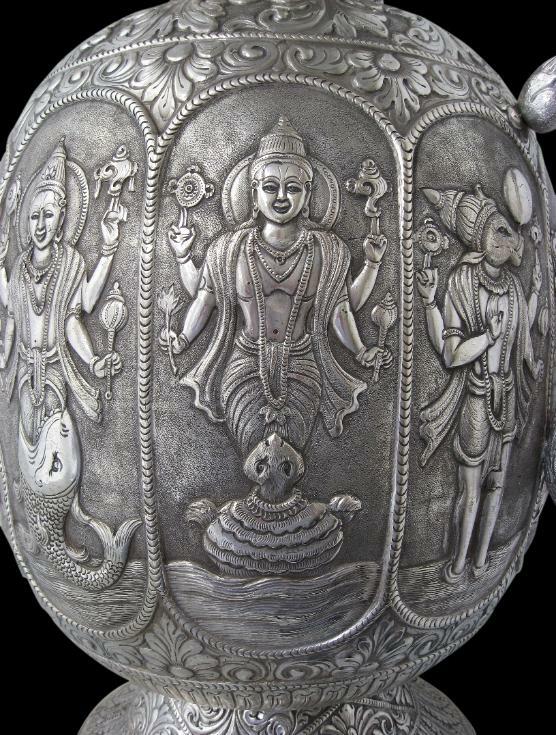 Kurma, the tortoise avatar, who helped the other gods during the Samudra Manthan or the churning of the ocean of milk. 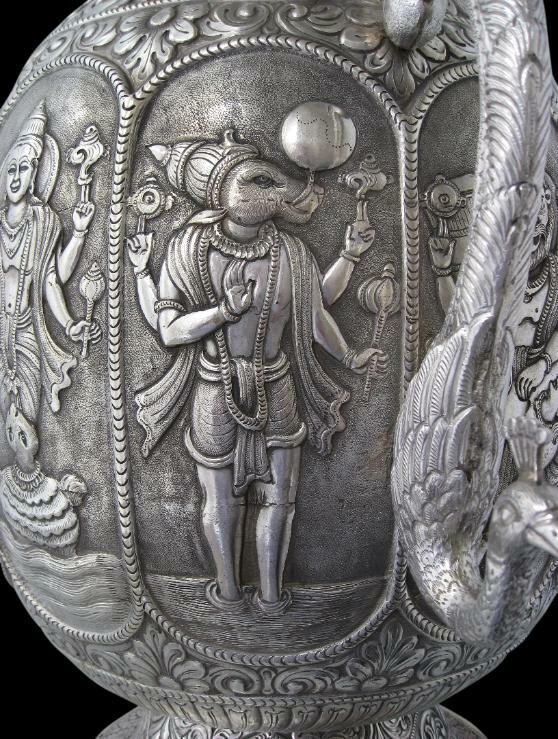 Varaha, the boar avatar, who rescued the earth from the ocean, by killing the kidnapper-demon Hiranyaksha. Narasimha, the half man-half lion avatar, who killed the tyrant demon-king Hiranyakashipu, to rescue the demon’s son Prahlada, who was a Vishnu devotee. Vamana, the dwarf avatar, who defeated the demon-king Bali. Parashurama, axe-wielding sage who killed the thousand-armed King Kartavirya Arjuna. Rama, the king of Ayodhya and the hero of the Hindu epic Ramayana. Krishna, the king of Dwarka, an important character in the Bhagavata Purana and the Mahabharata and a reciter of Bhagavad Gita. Gautama Buddha, although it might also be Balarama, the elder brother of Krishna. 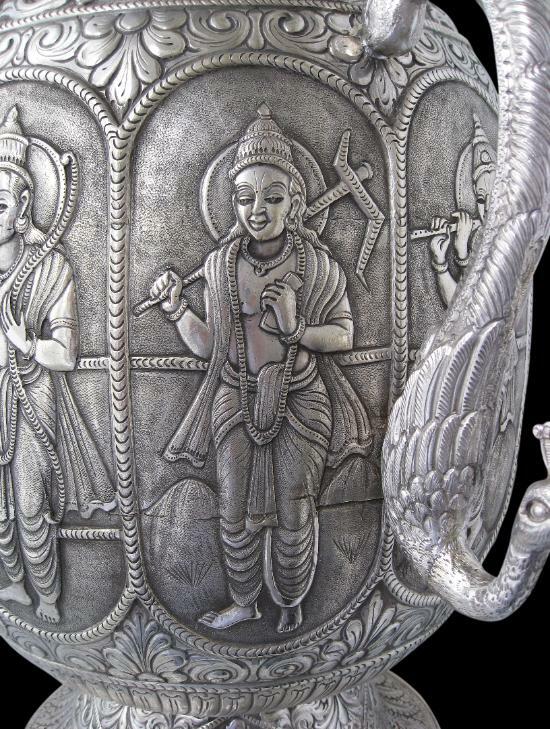 Balarama is sometimes considered a Dasavatar, in place of the Buddha. Kalki, the destroyer of darkness, who is expected to appear at the end of the Kali Yuga. Click on the film footage to see the motifs and relative size of this piece.